Summary: After 103 weeks on the New York Times bestseller list and with four million copies of The Kite Runner shipped, Khaled Hosseini returns with a beautiful, riveting, and haunting novel that confirms his place as one of the most important literary writers today. I'm sure you've heard the buzz by now but Khaled Hosseini has a new book coming out in May called AND THE MOUNTAINS ECHOED. It's being billed as "an unforgettable novel about finding a lost piece of yourself in someone else." If it's anything like his first two novels, then I'm sure to love it! Most of you have probably read THE KITE RUNNER and/or A THOUSAND SPLENDID SUNS so you know that Mr. Hosseini is an amazing writer. 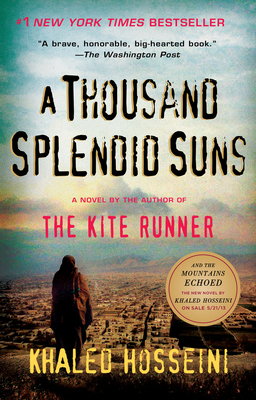 After reading THE KITE RUNNER, I admit I was a little concerned that A THOUSAND SPLENDID SUNS wouldn't live up to my expectations. I couldn't have been more wrong. I thought A THOUSAND SPLENDID SUNS was even better... and that makes me very excited to read AND THE MOUNTAINS ECHOED! Giveaway alert: Just in case you haven't read A THOUSAND SPLENDID SUNS yet (or you just want one to share), I have one copy to share with a very lucky reader. To enter, just fill out the form below before February 27th at 11:59 p.m. ET. I will randomly select and notify the winner the following day. This contest is open to those of you with U.S. addresses only. Good luck! I lost my copy to a friend :(...hope I win!